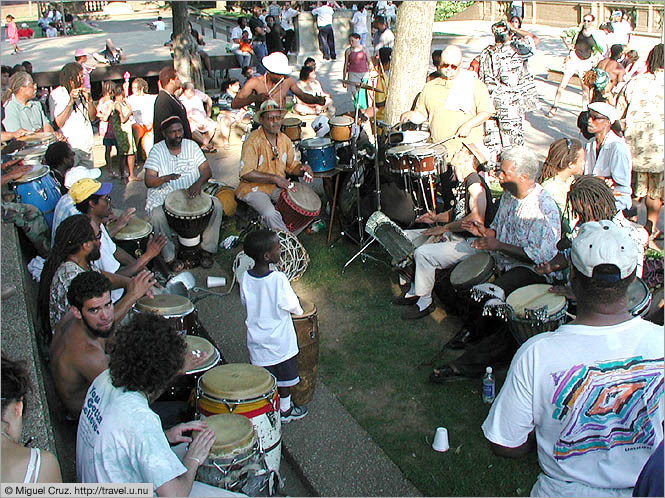 On warm Sunday afternoons, Meridian Hill Park (a few blocks straight to the west of Adams Morgan, between 15th and 16th Streets) is invaded by drummers from all over the city. Some come to drum, others to dance, others just to listen or hang out. Living across the street from the park, there's no way to avoid the sound, so I might as well enjoy it. My wireless network covers the park pretty well, and I've found that I can bring my laptop out and get into some serious concentration right in the middle of the drum circle rhythms.